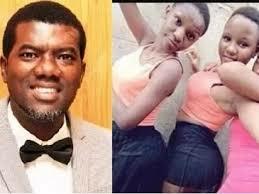 Aide to former President Goodluck Jonathan, Reno Omokri has taken to social media to say that anywhere satan can't go by himself, he sends slay queens to represent him. In a series of tweets by the ex-aide, Reno Omokri also mentioned that when demons retire from active duty, they always get yahoo boys to replace them. And if all the methods fail, the devil gives you a smartphone phone and internet credit.